The jellyfish appeared to be classy enough. Everyone else is still busy discussing whether or not Anne Curtis confronted Sam Concepcion at 71 Gramercy with the line, "You're not even classy enough to be here!" 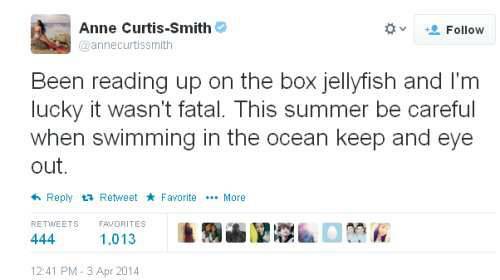 We chose to take up an issue that has more animal appeal-that of Curtis’ run-in with a box jellyfish. ABS-CBNnews.com reports that "on Wednesday night, April 2, actress Anne Curtis was rushed to the hospital after she was stung by a jellyfish while taping the fantasy series Dyesebel." Curtis was first to taken to hospitals in San Juan and Lipa in Batangas before she was finally brought to St. Luke’s Medical Center in Bonifacio Global City, Taguig. She was reportedly in pain and had rashes all over her body. Curtis, though, was quick to assure the public that she was on the road to recovery. 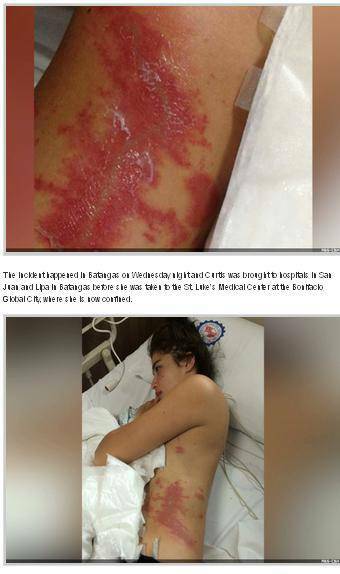 Later on, ABS-CBN even released photos of Curtis’ rash. We took a screenshot of the images they provided and, oh boy, we will never think of jellyfish as cute again.